Jansub Ustadji was a freedom fighter from rural Bengal, who was born in Heruka village in Birbhum. I am from that area, and have been researching the stories of freedom fighters in the villages there for a novel, stories that aren’t present in any historical archives. 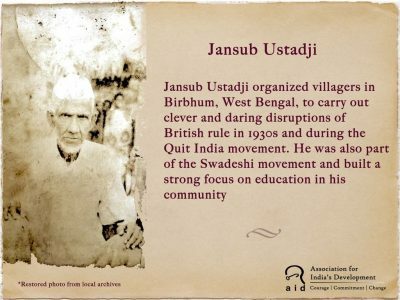 Jansub Ustadji was a key leader of a group of freedom fighters from different villages of Birbhum who came together to organize resistance at a local level in the 1930s. They were active in the Swadeshi movement, making their own clothes, and even took actions in their district alongside the Dandi salt march. Jansub Ustadji and Gadai Sheikh were from Heruka, Sona Kisku and Hopan Kisku were from Tiladanga, Jatayu Debangshi from Bagdohuri, Sudhir Ghose of Tentul Bariya, and Khan Bahadur of Sekedda. Jansub was inspired to associate with the freedom movement by his teachers at the high school in Bajitpur, several years earlier. 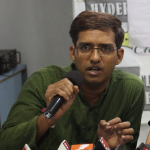 There is a story from the Quit India movement in 1942, when they disrupted a railway station. Jansub Ustadji, his nephew Gadai Sheikh and a well known local wrestler Nurul Haq from Kukhudihi village went to a railway station in the middle of the night. They picked up the railway tracks and threw them in a nearby field, and then fled to their villages on horseback. Being a remote region, the police were unable to catch them. All his life, police kept harassing him at his house, but the resistance movement in the village was clever enough that the police never had enough evidence to arrest him. Jansub Ustadji’s house was built of mud and had a huge yard, he used to hide in the yard various armed fighters disguised as blacksmith and handymen. He went through a lot of hardship in life to obtain an education, and he established a primary school in his village before India got independence. They later managed to start a high school as well, in 1974, and he taught there until he passed away in 1980. Though these are very local histories that don’t make it to national accounts of the freedom struggle, Jansub Ustadji and his comrades were freedom fighters and heroic figures much loved by the communities of Birbhum! Today, struggles for freedom and social justice are still continuing in Birbhum. 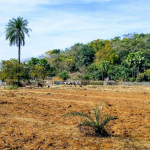 A lot of deforestation has happened in the area, and traditional livelihoods and agricultural practices are fast disappearing. People are running after the short term gains of modernity, without appreciating the rich history they come from. The region now needs more social leaders like Jansub Ustadji was, who are rooted in their communities and work for the ideals of Gandhiji’s Swadeshi movement.